What is on page SEO and how can I use it to atract search engines? When discussing SEO strategies, many people get carried away with tips and techniques and few bother learning what “On Page SEO” really is all about. On page SEO comes up a lot when you are deciding your strategy, and so does off page, but, what do they have in common? When you are doing SEO, the main goal is to “seduce” search engines, so that they choose you instead of millions of others. But let’s take a look at the other side of this relationship: what do search engines want from you? What are they looking for in this “relationship”. This is where we can separate things. See, if search engines are looking for a relationship, and you are the candidate, your personality is the on page SEO and your appearance is the off page SEO. Come have a closer look to the meaning of all of this. We’ve said that on page SEO is your personality and off page SEO is your appearance and by that we mean: on page SEO is quality of content and off page SEO is quality and quantity of external links leading to your website. On page SEO is about writing the right keywords, good content, define alt descriptions that are relevant and everything that you can find inside your website. Off page SEO is the opposite, , speed, backlinks, social media promotion, everything you can find on the outside. Do you understand now why, in order to seduce search engines, you need to have both on page SEO and off page SEO? Ok, if you got this far you realize that the way you look matters, but also you gotta have some sense of humor, some intelligence, some quality content. Well, on page SEO is all about making your content the best. We made a checklist for you to verify if you are killing it or if you need a little more preparation! A title tag is the title that is displayed on search engine results pages and it is suposed to be a description that correctly defines your page’s content. 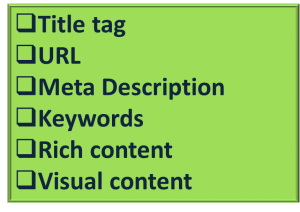 Title tags are very important for you on page SEO because they are a ranking factor that could make you or break you. Few people put the effort on title tags and this could really heart your on page SEO. To check this box you must make sure to write unique title tags. Once again, the importance of checking this box is about describing what can be found on your page. The more accurate it is, the better. Remember this: URLs must be shorter than 2,083 characters if you want them to work in all browsers. Meta description is that little description that appears underneath the title tag in a search engine results page. We got you covered on this topic. Check out our post about keyword research! Once you’ve covered this topic, check the box! Research shows that the best placed content on Google has about 2000 words. So, try to make super-complete articles that can really enlighten your audience about the topic you are writing about, especially if it is a competitive one. Dig deep into the subject, approach different views, make it complete but interesting! Visual content is great for increasing the user’s on-page time. That matters a lot because it can decrease your bounce rate which is a ranking factor. Invest in multimedia resources and make sure your images have ALT attributes. What does this mean? It means that you can also practice on page SEO with your visuals, by using relevant keywords. There are also ways to optimize videos, incorporate them in your content to rank better. Now you can check off every item of your box, but pay attention, looks are important to. Do you really want to seduce search engines? Then combine looks and personality and they won’t resist you! On page SEO + Off page SEO = Success! Hope you can now know what is on page SEO! For more articles check out other posts!